I'd like to go to an im@s concert, what should i do? Re: I'd like to go to an im@s concert, what should i do? If you're based in the U.S., visit http://blog.059pro.us/ and 059pro.us, avail yourself of their recollections and tips. Also, you may be able to join the group. I hope they'll make something similar for the 10th, and even though i'm going to japan this spring i wouldn't mind going again in autumn And if i absolutely need something in japan itself (like an address for the tickets) i'm sure i can organize this somehow through my japanese teacher. I wish they would announce when 10th will be already because I'm itching to see if I would be able to plan a trip for it or not. I'm curious what a realistic budget should be if I want to go. I've actually wanted to go years, but now that the date is coming closer it seems very unlikely that'll happen. Depends on how you want to live. I posted this in another forum on Crunchy a long time ago. Fourth full paragraph, under the picture of the stone marker and bike. Getting money from ATMs - Post offices and 7-11s have ATMs that accept foreign debit cards. I don't know when 7-11 started doing this, but a few months ago they did. For an easy listing, my comfortable budget is this. Please note - I overshoot some of these estimates on purpose. Transportation - Mostly solved with a JR Rail Pass (Google it). If you can't use it... worst case scenario, around 1600 yen for a metro one day pass (local travel only). Google for prices otherwise. Admission fees - Google the attraction, but I can't see paying more than 1000 yen for most places. Add plane tickets, shopping spree money, and equipment you have to buy before you go (if needed). From memory, round trip to Narita was $1700 last time I went. Arriving in Narita, taking a midnight flight back from Haneda was around $1400. Jeans do not dry well in hotel dryers and shirts don't do so hot either. I recommend hang drying. I don't do hostels since I don't like sharing rooms with strangers. Some hotels have curfews. Might be a good idea to ask. Some people say you can rough it in manga cafes a few nights every week for real cheap (1250 yen or so per night), but I don't think I'd like that. Capsule hotels can be cheap too, but I heard they want all your stuff to be out when you wake up in the morning, and aren't really a place to stay for anything more than one night. Hotels were getting booked last time I went though, so book a few weeks in advance. A few days in advance (or even the previous night), and there's no guarantee you'll be able to find a spot in a good place. I wouldn't be surprised if rooms around the concert place were booked solid as soon as the date is announced. If several people here want and actually do go to the (same) concert it would be nice to meet up somewhere. I think hotels shouldn't be too much of a problem, you don't have to stay in the ultimate vicinity, even if it's an hour by train or so, it shouldn't be much of an issue. Additionally these concerts seem to be in the big cities (Osaka, Nagoya and Toyko for the 9th anniversary concert iirc). My main concern is getting the ticket in the first place. But i already talked to my Japanese teacher and she said she'd help me if necessary. And then there is the "issue" of going to Japan twice in one year, since i'm going for this years hanami season. I wonder if i can convince someone to come with me to the concert, or to japan for general for that second time (i doubt the friend i go with in spring will come twice). And if all fails, i would also go alone. I got some advice from someone who went to 9th last year and I'm feeling confident I could save enough money to go on a trip by the time they had the lives last year (August-ish). I may or may not have someone going with me so we could probably split hotel costs and such. I'm making it my new year's resolution to make it to 10th! Producer-san, domu desu yo, domu! 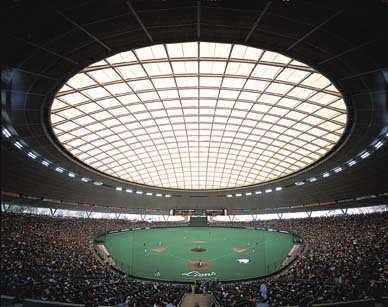 It's been confirmed that the 10th anniversary live will be at this dome. ※From March 1st on the name will be changed to "Seibu prince dome"
Well the arcade game did release in July after all. Well, by now i don't care about the date anymore :p I wanted to go in summer once anyway, for the fireworks and matsuri. If i can get a saturday ticket (765 only) i'll go. Did i see this correctly? The only way to get tickets is through a lottery you can only apply for if you buy some specific CDs? Or will there be a normal way to buy the tickets? Preordered the two ML cds. I'm pretty sure the tickets have always worked as a lottery.